Pictured in 1989 are The Four Guys, Laddie Cain, John Frost, Sam Wellington, and Brent Burkett who comprised the ensemble that sang together for the longest period of time during their illustrious 33-year career. The Four Guys Today --- Truly A Band of Brothers! Pictured are John Frost, Glen Bates, Laddie Cain, & Sam Wellington. SOMETHING ABOUT THOSE FABULOUS FOUR GUYS! METEORIC, EUPHORIC and HISTORIC is how many have described the rise to country music, “show biz” stardom of a singing quartet who arrived in Nashville on New Year’s Day, 1967, simply calling themselves THE FOUR GUYS. Like a ride on a rickety old roller-coaster, the journey began in the Steubenville-Toronto, Ohio, area for group members Brent Burkett, Berl Lyons, Richard Garratt and Sam Wellington as they followed a musical dream determined to make a significant mark on Music City , USA . They soon found out that dreams can come true faster than the dreamers had ever imagined. 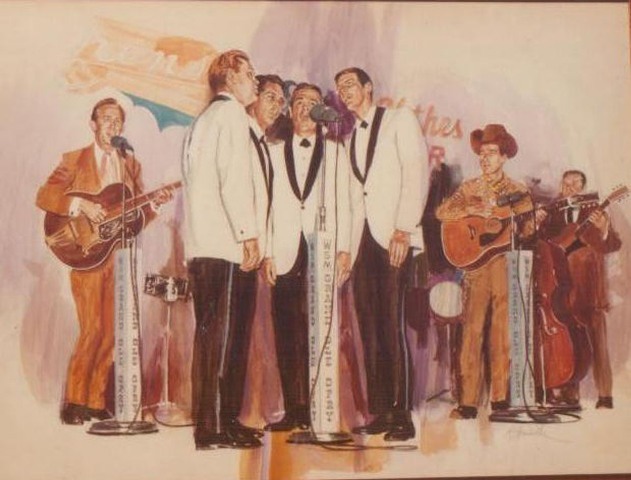 Little more than a month after arriving in the recording capital of the world, The Four Guys landed a guest spot on the world-famous Grand Ole Opry where they made their first encore appearance of an updated version of the old folk song SHENANDOAH. It was the Friday Night Frolic, which is what they called the show created to serve as a preview for the Saturday night institution, Grand Ole Opry. 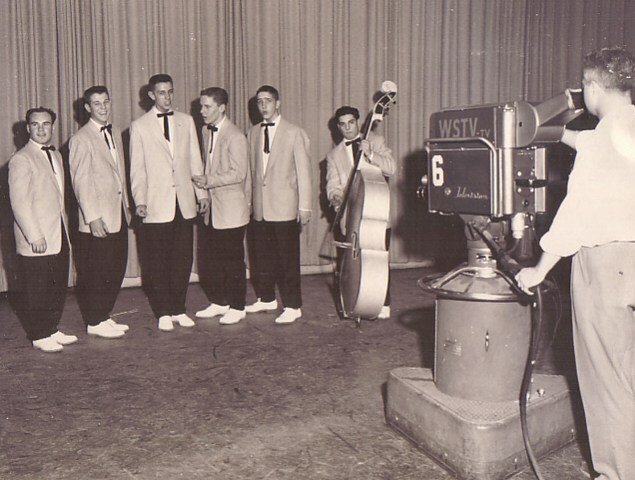 Usually, Guests were asked to perform on Fridays since the big Saturday show was reserved mostly for the regular Opry star family with little room for guest acts. Still more unusual was the fact that “The Guys” did not have a hit record or even a recording contract. Rule of thumb at that time was for an upcoming performer to have had two or three hits under their belt before an invitation to appear as a guest was ever extended. That particular Friday night in early February was special. Opry Manager, Ott Devine, had just witnessed what he felt was an historic musical performance and wasted little time inviting The Four Guys to return the next evening to repeat their performance of SHENANDOAH. Return they did to a thunderous audience reception resulting in their being invited to return the following Friday and Saturday nights. The response was the same; encores throughout February, March, and into April. The group encored EVERY performance until finally, Manager Devine invited The Four Guys to become LIFETIME members of the greatest country music show on Earth. No other vocal group had been so invited before or since. To become a regular member of the Opry cast meant the “show would be available to “The Guys” whenever “The Guys” would be available to the show.” In those days, that number was twenty-six (26) Saturdays per year. The required performance number was later reduced to twelve (12) with partial credits given for Opry Matinees and Friday appearances. In still later years, the magic performance requirement was reduced even further. A recording contract with Mercury Records followed with The Four Guys being asked to perform on the hit album, WINE ME UP, with their label mate and country music legend, Faron Young. 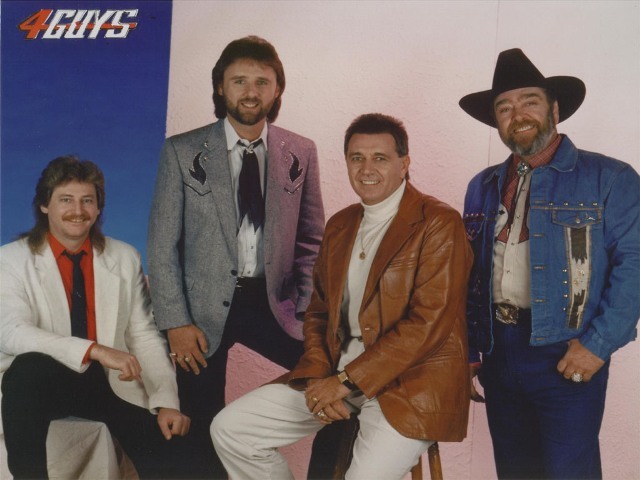 “The Guys” were then asked to open for Hank Williams, Jr. on his road show and toured with that show for more than two years. Meantime, they interspersed their rigid road schedule with their regular Opry performances and special engagements on their own and with Jimmy Dean in Las Vegas . 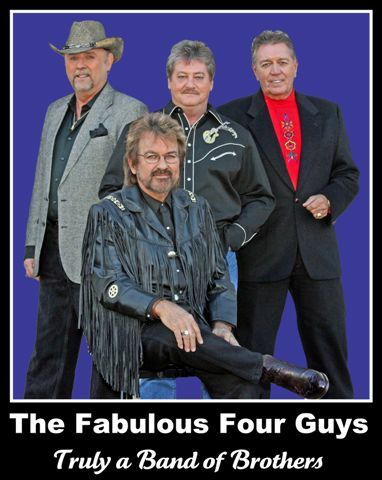 As their popularity continued to grow, The Fabulous Four Guys (the descriptive adjective FABULOUS was added to their name by their friend and eventual Country Music DJ Hall of Fame member, Charlie Douglas) were asked to join the Charley Pride Show, which also featured another up and comer, Ronnie Milsap. RCA Records, Pride and Milsap’s label, then signed the group to create an all-RCA show. The Pride Show, considered by most to be the top show in country music at the time, played to SRO crowds in every major venue throughout the U.S. and Canada . The show also received rave reviews playing The Las Vegas Hilton and Harrah’s Lake Tahoe, Nevada, along with displaying its’ musical wares on numerous network TV shows. Meanwhile, awards and accolades continued to mount for the Opry’s only four member singing group: Music City News Fan Magazine named The Four Guys top three finalists nine years in a row in the Vocal Group of the Year category; The Country Music Association nominated them in the same category in 1975; The Country Music Hall of Fame inducted them into it’s treasured Walkway of Stars in 1992 along with a star-studded cast, including Billy Ray Cyrus, Steve Wariner, Trisha Yearwood, Patty Page, Connie Smith, Marty Stuart, Janie Fricke and Graham Parsons. Following two years of touring with the Pride Show, The Four Guys returned to Nashville to open and successfully operate their own theatre-restaurant called, appropriately enough, THE FOUR GUY’S HARMONY HOUSE. This venture lasted ten years until “The Guys” took over the beautiful Stagedoor Lounge in the massive Opryland Hotel complex. They also brought their huge tourist following with them. After four years there, the high seas called and “The Guys” began to focus their attention to regular performances aboard the cruise ships of Commodore and Regal Cruise lines. During the next ten years, 1989- 1999, The Four Guys were engaged to perform on a total of seventy-five Caribbean and Central American cruises, including six trips to the Panama Canal . Time out was taken in 1995 and ’96 to perform more than fifty weeks at Eagle Mountain Theatre in Pigeon Forge, Tennessee, (Dollywood country), where the group headlined their own show. The Four Guys scored their greatest recording success in the 90’s with numerous “TOP FIVE” and a couple of NUMBR ONE records in Europe and the Netherlands while big hits in the U.S. continued to elude them. Not to worry, The Guys continued to build their fan base the hard way through outstanding live stage performances. In late 1999, founding members Sam Wellington and Brent Burkett decided to retire after performing together professionally for more than thirty-two years. Brent chose the quiet lifestyle of tending his farm in Fairview, Tennessee, west of Nashville, while Sam became a published author of books and short stories written in the shade of palm trees on Florida’s west coast. After battling health problems for several years, Brent passed away on October 13, 2007. Sadness filled the air on that bright sunshiny day in Middle Tennessee as Sam Wellington and longtime former members John Frost, Gary Buck and Glen Bates gathered at the gravesite of their friend and singing partner. During an impromptu moment, Brent’s youngest brother Talmage asked the four friends, who had been estranged for many years, to join him in the singing of “Amazing Grace” as a final tribute to HIS sibling and THEIR performing comrade. The combination of Wellington, Frost, Buck, and Bates had not sung together in more than twenty years. One of the most touching moments in any of their lives took place during the singing of that “grand ole hymn” on that somber afternoon. Completely overcome with emotion, Wellington huddled his former partners calling them TRULY A BAND OF BROTHERS. He pledged to each that he would personally nurture their reunion of that day and rekindle their relationship as brothers and friends. Several social events followed thus spawning the idea of a possible Four Guy’s performance reunion. As a result, plans were laid and executed for several engagements during the June 2008 CMA Music Festival in Nashville, including a special performance on the Grand Ole Opry and a “Surprise Guest” appearance at the annual Reunion Of Professional Entertainers (R.O.P.E.) event. Also being scheduled are selected appearances both in and out of country music, i.e….corporate events, cruises and the Nevada entertainment circuit, all arenas where The Four Guys once headlined. Since the June, '08 reunion, Gary Buck has been replaced by Laddie Cain, who was with the group from 1980 - 2000. Laddie has been welcomed home to the new Band of Brothers. Who says you can’t go home again? The Fabulous Four Guys are set to reacquaint themselves with some old familiar stages and perhaps find a few new ones along the way as they develop still another stage in their personal and professional lives…this time performing as TRULY A BAND OF BROTHERS!! Music Association, Nominated Top Five!